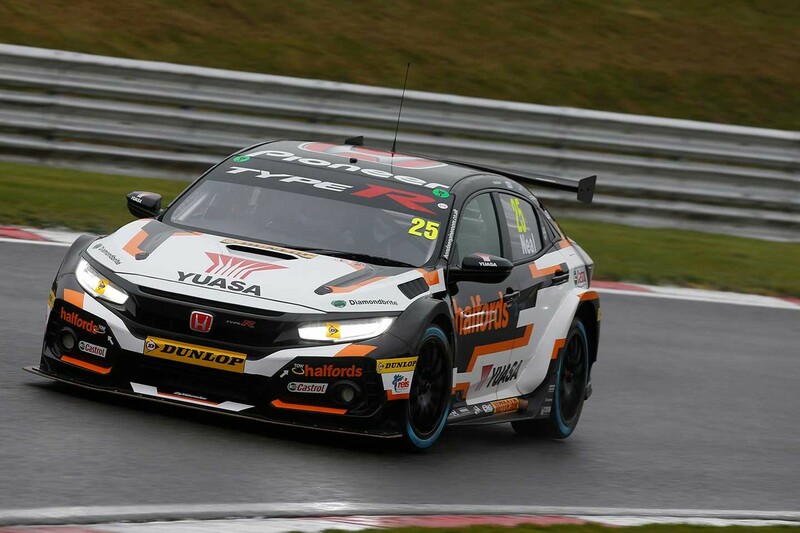 Honda leads the British Touring Car Championship manufacturers' table following the opening three rounds of the 2019 season, while Halfords Yuasa Racing driver Matt Neal had a podium finish in the final race snatched away on a difficult day of ever-changing weather at Brands Hatch. The Honda Civic Type R FK8s of Neal and team-mate Dan Cammish secured sixth and seventh on the grid after a challenging qualifying session in which the track steadily became damper, and which was interrupted three times by red flag stoppages. Race one was decided before the start when light rain resulted in the front half of the 30-car grid, including both Halfords Yuasa Hondas, switching to treaded wet-weather tyres. But the rain eased and those towards the rear who had gambled on starting on slick dry tyres simply drove through the field. Cammish endured a difficult race to finish 15th, his Civic hit at one point by a spinning rival, but Neal finished the best of the 'wet-weather' runners in eighth, overtaking five cars that had started in front of him and securing the manufacturer's prize for Honda. Race 2 proved frustrating for both Honda drivers as they fought to overcome the frantic midfield battles on the tight circuit. Neal lost several places with wheelspin at the start but recovered to take 11th while Cammish staged a recovery from 16th start spot to finish just behind his team-mate. Neal's day was then considerably brightened when the reverse-grid draw for the final race put his Civic Type R onto pole position. Neal's Halfords Yuasa Racing Honda was beaten away at the start of race 3 but quickly closed on leader Stephen Jelley and took the top spot on the seventh of the 24 laps. The Honda, however, was running the softer-treaded option tyre mandatory for one race per meeting, and as it started to wear Neal was soon closed down and passed by Tom Chilton and Rory Butcher. A battle with a resurgent Jelley saw the two cars make contact at one point. Neal looked to have held on to the final podium spot until heading on to the last lap damage from earlier contact caused a rear suspension breakage. The Halfords Yuasa Racing driver dragged his crippled machine across the line to salvage eighth place, and this was enough to put Honda at the head of the manufacturers' championship at the end of the weekend. Dan Cammish endured a frustrating race. Also on the soft option tyre, he was caught up in the frantic midfield battles, finishing 14th in the middle of a frantic pack of battling cars. "It turned into a frustrating weekend through no fault of our own. The soft tyre did make things more challenging in the final race but I think I could have defended my position. However after I suffered contact I could feel the damage immediately, and unfortunately the suspension gave way just one lap too early. On to Donington!" "I was pleased to play my part in securing Honda the manufacturer award in race one, but the conditions beat us – once I was shuffled into the midfield pack it was so hard to pass on the tight Brands Hatch Indy Circuit. But we clearly have a lot of speed in the car and that's a positive to take out of a frustrating weekend." Rounds 4-6 of the British Touring Car Championship will take place at Donington Park, Leicestershire on Sunday 28th April.